(1) Total businessstood atRs. 3,67,831 crore as on 31stMarch2018 as against Rs. 3,68,119crore as on 31st March 2017. (2) Total depositsincreased to Rs. 2,16,832crore as on 31stMarch 2018 as against Rs. 2,11,343crore as on 31stMarch 2017. The Bank has reduced the concentration of Bulk Deposits and increased Retail Term Deposits to have a stable deposit profile and reduce the cost of funds. (3) CASA of the Bank improved to 36.75% as on 31st March 2018 as against 36.09% as on 31st March 2017. Total CASA has increased from Rs. 76269 crores as on 31.03.2017 to Rs.79678crores as on 31.03.2018,SB registered 5.35% YoY growth as at 31st March ‘18 over 31st March ‘17. (4) Gross Advances stood at Rs.1,50,999 crore as on 31st March 2018 as against Rs. 1,56,776 crore as on 31stMarch 2017. The Bank has rebalanced the credit portfolio with RAM’s (Retail, Agri and MSME) share of total domestic advances improving from 58.74% to 64.82% YoY (March ’18 over March ’17). (5) MSME Segmentgrew by 6.71% YoY (March ’18 over March ‘17). (6) Retail Segment grew by 17.98% YoY (March ’18 over March ’17). (7) Core Retail Advances (Housing Loans, Vehicle Loans, Clean Loans, Education Loans, Mortgage Loans) grew by 26.26% YoY. (8) Priority Sector Lending as a % of ANBC as on 31.03.2018 is 47.47% as against the requirement of 40%. Agriculture as a % of ANBC as on 31.03.2018 is 20.23% as against the requirement of 18%. (10) Net Profit: Net Loss for the quarter ended 31stMarch 2018 is Rs. 3606.73crore as against Rs. 646.66 crore for the quarter ended 31st March 2017mainly due to provisioning requirements including higher provisions on account of RBI guidelines on revised framework on Resolution of Stressed Assets. Pursuant to the revised framework, the Bank has classified the specific restructured accounts in accordance with extant IRAC norms and made a provision of Rs.799.37 crores towards such accounts during the current quarter. (11) Total income for the quarter ended 31st March 2018 is Rs.5814crore as against Rs.5662crore for the quarter ended 31stMarch 2017 registering a growth of 2.68% YoY. (12) Interest income stood at Rs.4828 crore for the quarter ended 31st March 2018 as against Rs. 4630 crore for the quarter ended 31st March 2017 registering a growth of 4.28% YoY. 31st March 2018 as against Rs. 1032 crore for the quarter ended 31stMarch 2017. (14) Total Expenditureincreasedfrom Rs. 4621 crore for the quarter ended 31st March 2017 to Rs. 4685 crore for the quarter ended 31st March 2018. (15) NPA MANAGEMENT: Gross NPA as at 31st March 2018 is at Rs.38180crore with ratio of 25.28% as against Rs.35098 crore with ratio of 22.39% as on 31stMarch 2017, with the fresh slippage due to revised frameworkof stressed asset of Rs. 3629 crore. (16) Total recovery of Rs. 5726 crore achieved for quarter ended March ’18as against the recovery of Rs.2729 crore during quarter ended March ‘17 while the total slippage for quarter ended March ’18stood at Rs. 9868 crore mainly on account of the impact of RBI guidelines on revised framework on Resolution of Stressed Assets.Pursuant to the revised framework, the Bank has classified the specific restructured accounts in accordance with extant IRAC norms. (17) Net NPA is at Rs. 20400crore with ratio of 15.33 % as on 31st March 2018 as against Rs. 19749 crore with ratio of13.99% as on 31st March 2017. (18) Provision Coverage Ratiois improved to 59.45% as on 31st March 2018 as against 53.63% as on 31st March 2017. (1) Total business stood at Rs. 3,67,831 croreas on 31stMarch 2018 as against Rs. 3,68,128 crore as on 31st December 2017. (2) Total deposits stood at Rs. 2,16,832crore as on 31st March 2018 as against Rs. 2,16,592crore as on 31st December 2017. (3) CASA of the Bank has improved to 36.75% as on 31st March 2018 as against 35.33% as on 31st December 2017. (4) Gross Advancesstood at Rs.1,50,999crore as on 31stMarch 2018 as against Rs. 1,51,536 crore as on 31st December 2017. (6) Net Profit: Net loss for quarter ended 31stMarch 2018is Rs.3606.73crore as against Rs. 971.17 crore for quarter ended 31st December 2017, mainly due to NPA provisioning of Rs 3155.20 crore additionally. Net loss is due to provisionsincluding higher provisions on account of RBI guidelines on revised framework on Resolution of Stressed Assets. Pursuant to the revised framework, the Bank has classified the specific restructured accounts in accordance with extant IRAC norms and made a provision of Rs.799.37 Crores towards such accounts during the current quarter. (7) Total income for the quarter ended 31stMarch 2018 is Rs.5814 crore as against Rs.5062 crore for the quarter ended 31st December 2017 registering a growth of 14.86% QoQ. (8) Interest income stood at Rs. 4828crore for the quarter ended 31stMarch 2018 as against Rs. 4255crore for the quarter ended 31st December 2017 registering a growth of 13.46% QoQ. 31stMarch 2018 as against Rs. 808crore for the quarter ended 31st December 2017 registering a growth of 22.18% QoQ. (10) NPA MANAGEMENT: Gross NPA as at 31stMarch 2018 is at Rs. 38180 crore with ratio of25.28% as against Rs. 33267crore with ratio of 21.95% as on 31st December 2017. (11) Total recovery of Rs. 5726 crore achieved for quarter ended March ’18 as against the recovery of Rs. 3021crore during quarter ended December ’17 while the total slippage for quarter ended March ’18stood at Rs. 9868 crore as against Rs. 1432crore for quarter ended December ’17. The fresh slippage increased due to compliance of RBI guidelines on revised framework for stressed assets. (12) Net NPAstood at Rs.20400 crore with ratio of 15.33% as on 31stMarch 2018 as against Rs. 17761 crore with ratio of 13.08% as on 31st December 2017. 31stMarch 2018as against57.83% as on 31st December 2017. (1) Operating Profitfor the year ended 31.03.2018 is Rs.3628.08 crore as against Rs.3650.20 crore for the year ended 31.03.2017. Rs.6299.49 crore as against Rs.3416.74crore for the year ended 31.03.2017, mainly due to increase in provision by Rs. 2937 crore. (3) Total income for the year ended 31.03.2018 is Rs. 21662crore as againstRs.23091 crore for the previous year (2016-17) on account of less treasury income and contraction of credit. (4) Interest income stood at Rs.17915 crore for the year ended 31.03.2018 as against Rs. 19719 crore for the previous year (2016-17), mainly due to additional slippage. (5) Non Interest Income: Non-interest income is Rs. 3746crore for the year ended 31.03.2018 as against Rs.3373 crore for the previous year (2016-17) registering a growth of 11.08%. (6) Total Expenditure declined by 7.24% from Rs. 19441 crore for the year ended 31st March 2017 to Rs. 18033 crore for the year ended 31st March 2018. (7) Recovery in NPA accounts for the year ended 31.03.2018 is significantly higher at Rs. 15496 crore as against Rs.8710crore for the year ended 31.03.2017. · Average Cost of Depositis 5.49%for the year ended31.03.2018 as against 6.17% for the year ended 31.03.2017. · Average Yield on Advancesis 7.50% for the year ended 31.03.2018. · Cost to Income Ratiois60.61% for the year ended 31.03.2018. · Net Interest Marginis 2.73% for the quarter ended 31.03.2018 and 2.19% for the year ended 31.03.2018, mainly due to increase in other interest income. During the quarter ended 31.03.2018, the Bank has received an aggregate sum of Rs. 4694 crore as capital infusion by the Government of India for 2017-18as part of the Recapitalisation Plan for Public Sector Banks for which the Bank has allotted203,82,11,029 equity shares of Rs.10/- each for cash at Issue Price of Rs.23.03 per equity share (including premium of Rs.13.03 per equity share) aggregating to Rs.4694 crore on preferential basis, to Government of India. GOI’s shareholding has increased to 89.74%. Indian Overseas Bank, has always been a pioneer in launching various digital products and schemes that benefit customers the most along with utmost convenience. v IOB Nanban is a mobile app launched for the benefit of our customers for performing non-financial transactions. Customers can download the app from Google playstore. v IOB Sahayak, a mobile app for our Staff has been releasedby our bank. The following features are available currently. This app will be a comprehensive app for staff to improve productivity. v Bharat Bill Payment System (BBPS) is an integrated bill payment system introduced by National Payments Corporation of India (NPCI), offering interoperable online bill payment service to customers. IOB Customers can now pay the following through BBPS system using Internet banking and Mobile banking. There are two modes of integration. Tamilnadu Electricity Board has been made ONLINE as the Bank’s FIRST Biller in BBPS. 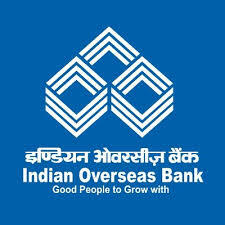 Indian Overseas Bank is the FIRST Public Sector Bank to Go LIVE as a Biller Operating unit in BBPS.